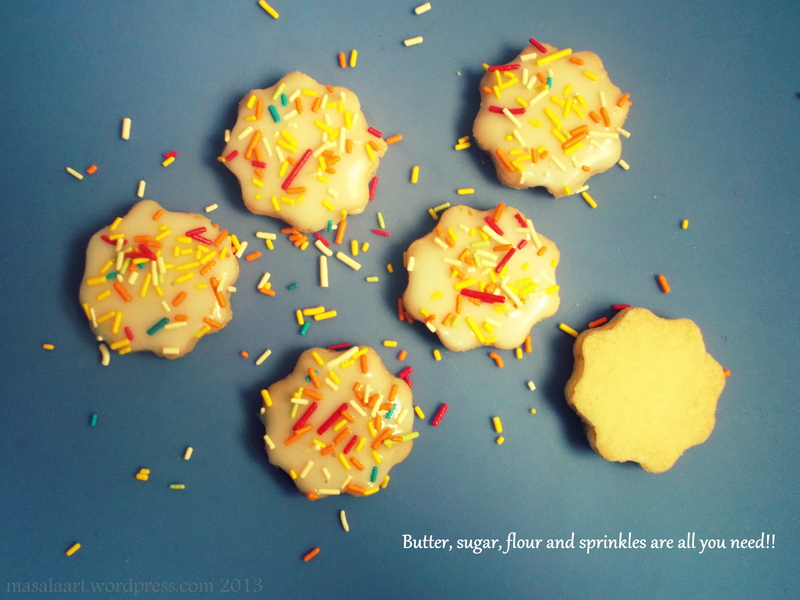 Easy Birthday Treats: Frosted Sugar Cookies! In a large bowl, cream the butter and sugar together till it becomes light, fluffy and pale in colour. Sift the flour over this and continue to beat until the mixture resembles wet sand. Now use your hands and bring the dough together on a clean, dry surface, and roll into a ball. Cover in cling wrap or place in a large ziplock bag and rest in your fridge for 30 minutes. Using a cookie cutter, cut out shapes from the dough and place on a baking tray. Bake at 180C for 15-20 minutes or until the cookies become golden at the edges. For the frosting/glaze, mix the icing sugar and milk well till it forms a sticky, gooey paste. It should not be too thick…it should be almost pouring consistency. You need to be able to dip the cookies in the glaze. Once your cookies have cooled completely, dip face down in the glaze, add sprinkles and eat! ♥ Replace 80 g of flour with 80 g of ground almonds/walnuts/hazelnuts for a nibbly cookie? ♥Swap the sprinkles for chocolate chips? ♥Frost the cookies, and set up a little section with different kinds of sprinkles and candy toppings so kids can have a DIY sprinkles bar? These are so sweet. Agreed, you’re never too old for sprinkles!